Laureen: All right. We’ll hold onto them. Let’s talk about the CPB. That’s the Certified Professional Biller credential that is from the AAPC. The first person was asking about CPB exam strategies and test taking tips. Chandra – surprise, surprise – does hold that credential. Normally, what we like to do is go out to the AAPC site and look at the competencies that they list and basically discuss how to prepare for that. We’re going to come here and go to CPB. This is really true for any credential that you’re trying to figure out. I’m getting a lot of questions on the CDEO that Chandra and I just passed for the Certified Documentation Expert for Outpatient, I got it this time, because there are no study guides, there’s no material for it yet. So we said, “This is what we do.” We come here and you go and you look down and you see what they tell you. They call it exam breakdown. I call them competencies. But basically, you get a feel for how many questions. This one’s unusual in that it’s 200 questions. Normally, their exams are 150, but it is 5 hours and 40 minutes. You do get a free retake. They just upped their prices. It is open book. If you need to know which books are allowed, approved manuals, again, this is true for any of the credentials you’re going for with the AAPC, and then they’ve got these little like bricks that you have to expand. These are the general categories that you’re going to be tested on. You need to understand the different types of insurance, understand billing regulations, HIPAA and compliance, reimbursement and collections, billing, coding, and case analysis. That’s why for our students that want to do both billing and coding, we normally tell them to start with coding because coding is a part of billing, and a part of billing curriculums and the billing credential. It’s not the whole thing, it’s a small piece of it. That’s this piece here, going from the top to the bottom. Under Types of Insurance, there’s 44 questions out of the 200 on the types of insurance. You need to know the difference between managed care and Medicare, and then the Blues, and Tricares, and Workers Comp, third party payers. They are different. Maybe one day soon you might have a one-payer system. Who knows? But for right now, we have a multi-payer system. What you’re going to be asked on this particular certification exam are the differences between them to the tune of 44 questions’ worth. Anything on types of insurance you want to share, Chandra? Chandra: No. I have more kind of general overall comments on the CPB certification exam. Laureen: Do you want to do that first before we go into the details? Chandra: No, I’ll let you keep going. Whatever works. Laureen: Okay. Then I’ll let you bring it home. For billing regulations, there’s 25 questions related to accountable care organizations, the CCI edits, you need to be aware of how they work. LCDs and NCDs, incident to billing, global packages, unbundling, completion of the 1500 and the UB, Chandra just mentioned those two, payer payment policies. Courses package this all up for you. If you’re on a true shoestring budget, if you google each of those terms or use my little trick that I taught before with “site:” and go to the CMS site especially, you’ll probably find 90 percent of this information there that you can self-teach yourself. Of course, it’s better to do it with a course where you have exercises and you can tap into an instructor if something isn’t clear, but it is all out there. Next are just 10 questions on HIPAA and compliance. But these are a lot of information here, but it’s just a small number of questions. For reimbursement and collections, you have 28 questions. They’re going to talk about the RBRVS system, payer and patient refunds, credentialing, accounts receivable, fair debt, patient statements, patient dismissal, professional courtesy. 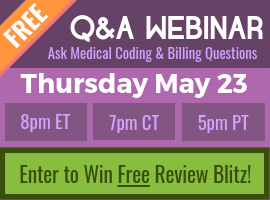 These are all topics that affect the billing departments in physician practices. Collection agencies, bankruptcy payment plans, pre-auths, claim editing tools, remittance advice. These are all things you need to understand as a biller. The billing itself, there’s 28 questions. The appeals process, denials, lots of webinars on that, claims tracking, timely filing, what are the laws related to that, demos, you’ll hear the demographics, super bill, and encounter forms. Big time of the year right now, all the new codes. You want to make sure those forms are up to date. What is the retention of records policy that you have to be aware of? Balance billing, telephone courtesy, electronic claims submissions, clean claims, audit the billing process. Coding, there’s 15 questions. That’s a broad category. It could really be just about anything. Out of 200 questions, 15, you need to know it enough, but don’t make sure you feel like you need to be an expert in Radiology, an expert in Pathology. You just need to understand the basic guidelines and how to do the coding. Chandra: That’s only 7.5 percent of the entire exam. You have to get a 70 or more to pass. Not that the coding is not important, but yeah. Laureen: We like to, with the courses, balance it out based on the number of competencies that are going to show up on the exam and prepare you accordingly. Of course, the biggie is 50 questions related to cases. It might be one case that has 10 questions. At any rate, I will let Chandra give us her two cents as the one who actually took the CPB exam. Chandra: I took the CPB exam. The first thing I should say before I preface this, and what I tell everybody is, I’m not a biller. I haven’t been a biller for several years. Laureen: She just plays one on the internet. Chandra: Yeah, I just play one on TV. It was funny. When I took the exam, it was actually because I got a phone call from someone related to AAPC that needed somebody to teach the class. It was not too long after the credential came out and they didn’t have anybody available that had the certification and experience to teach it. They asked me if I would be willing to take the certification exam. I thought, “I’m not a biller.” That was my response. He said, “No, but you can teach it. You understand it. You’ve done it before. Can you take it?” I said okay. At the time I took it, I hadn’t actively done billing day to day, day in and day out for seven years. I was an auditor. I worked on the compliance side of things. Yes, I understood probably the cycle and how everything works. But the thing I think that frustrated me most were, there are certain things when you read through all of the competencies, there are a number of things that they expect you to know off the top of your head that, quite frankly, I don’t need to know in my opinion day to day because I can go look it up on the internet. I can go find the information. That would be my caution is if you’re thinking about winging it, you’re thinking about taking it, you might want to at least do a review class. Do something or review all of the competencies and make sure that you really have a good understanding of everything that’s included for that particular exam. Laureen: We also have a CPB Blitz by Jo-Anne Sheehan. You’ve probably seen her on some of our Q&A webinars, she’s ran a successful billing company for years which her daughter took over. I think she’s still very involved in it though. It’s very hard to leave your baby once you create it. She’s worked hard on writing that up for us and getting the recordings done for that. That should be very good, no doubt, to help you prepare for the CPB exam. Chandra: We’ve got a couple of comments that kind of dovetail into this. The first one was someone asked, “Does CCO have a course on this?” Yes. We offer a full medical billing course separate from our medical coding course. I’m sure Laureen’s going to pull that up for me. That’s another course that we also license through the AAPC. You get both our material and their material; which is a great bonus. You get double what you would have gotten just through their program. It’s a twofer. Our course is very much built around including all of these different competencies that are tested on the exam. In addition to that full course – I know Jo-Anne’s created the CPB Blitz – but we also have a free practice CPB exam. If that’s something you’re interested in, make sure you go out and check that out. Laureen: By the way, all of our freebies are at cco.us. Right here with a little heart, freebies. You just click on that. This is to join our newsletter. This is to get on our next free Q&A webinar. Here’s all our free practice exams. We used to only have one. Now we’ve got CPC, ICD-10, COC, CPB, and the most recent addition, the CRC. Our goal at CCO is to have the free exams first. We like to really give back and help people to do these free exams to get a baseline to see, do I need a full course or can I get it away with just a review Blitz? That kind of really helps. The next step is we work on developing the paid exams. Just to give you guys an idea, each of these exams when you take the number of man or woman hours to create them at an average hourly rate, not exorbitant, the cost ends up being between $5000 to $6000 to develop these tests. Even though they’re free, we’re doing it to give back to also get you into our funnel and sending you information, letting you know about our teaching style, and our courses, and events like this. But they are not designed to be shared. It’s for one user. We’ve done segments on being ethical and all that. I just would encourage when you do it or if you do one of the purchased ones especially, just keep it to yourself. Don’t share it. Even though a lot of people want to be a hero and help their friends, it really isn’t the right thing to do. We would ask that you would respect that because we did make a difficult decision and we made them printable, because we want it to be like the real exam. The real exam right now is a paper exam. It’s not a computer exam. You’ve got your booklet and you’ve got your Scantron form. We try and duplicate that for you. We allow you to print the questions. Unfortunately, as soon as you make it like a PDF, it’s very easy to share. We do make you log in and pop in your answers in the online version, and that’s how you get your score in the rationales. At any rate, that’s our free practice exam lineup. Did we cover everything we wanted to here? Chandra: I think so. There were just a couple of comments about people saying, “I’ve had students take the CPB. One of them was even an LPN, said it was one of the most difficult exams she’s ever taken.” Absolutely. Think of the sheer amount of information you’re supposed to know because all billing involves coding, so you really got to understand the coding. Yes, it’s a very small general percentage of the exam. But there is so much more that you have to know from a regulatory and payer perspective beyond just the coding. I just read your take on the CPB. I bought the Blitz because I had a very short course on Billing in my coding class. I kept my book “Understanding Health Insurance” I keep thinking of just buying the course but two things keep from doing so: the cost and when I look at what is taught it seems you use the same book I have. My employer told me this week I did not need to sit for the CPB that I can learn every thing on the job. He believes having my CPC is enough.